~ "Four more years!" is a popular chant by the supporters of an incumbent president's re-election, but what changes in four more years? My prediction: very little. I expect the GOP to draw mostly the wrong lessons and double down on most of their current policies, strategies, and candidate choices. It will be after 2016 that we see real change. Obama has been re-relected and need not worry about his next election ever again. Now it's legacy-building time. He will not change his "post-partisan" posture and I expect none of the smug over-reach that characterized George W. ("I've earned political capital and I intend to spend it") Bush when he won in 2004. 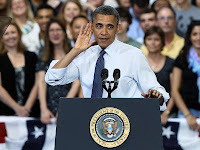 To the dismay of progressives, Obama will continue to pre-negotiate with himself, offering policies that the GOP will unfailingly call liberal despite their being solidly center-right, and that were often, like the Affordable Care Act, originally Republican ideas. In the Senate, which some (including me) thought would flip to the GOP, Democrats may even gain a seat. Why? Republicans ran candidates too extreme even for conservative states, and lost in Indiana and Missouri. Majority Leader Harry Reid will not, however, reform the filibuster or any of its other archaic practices, and the world's least representative democratic body will continue its systemic dysfunction. In the House, the GOP appears to be gaining seats. It would be wrong to think of this as extending or confirming the 2010 election trends, despite how much the GOP wishes that were true. The electorate is certainly not embracing the radical Republican agenda, as the defeat or near-defeat of many in the wingnut caucus (West, King, Bachmann, Walsh) shows. Many voters like their own Congresscritter even as they detest Congress as a whole. The minimal change to the GOP House is due as well to the fine art of gerrymandering the districts and the work of GOP statehouses following the 2010 mid-terms and decadal redistricting. The sweeping passage of marriage equality and marijuana laws in several states and the asymmetric demographics of voters this year presage a real and lasting trend. The power of older, evangelical white men is ebbing. The Baby Boomers are starting to fade and a new, more multicultural generation is rising. GOP-aligned pundits are already averring the party's need to craft a new coalition, and there is much talk about the impending GOP "civil war". Will the GOP decide they need to embrace the new demographic alignments and ease up on hard-line policies such as on immigration? Or will they conclude that Mitt Romney wasn't "conservative enough" and failed to adequately articulate conservatism? In other words, will they change the policy, or change the front man? GOP candidates are now subject to more litmus tests than a classroom full of chemistry experiments. On taxes, on regulation, on abortion, and on many other subjects the party moves in lockstep. Outliers are ruthlessly purged in pursuit of a stringent ideological purity. Compromise is unthinkable. Now it’s time for the president to propose solutions that actually have a chance of passing the Republican-controlled House of Representatives and a closely-divided Senate, step up to the plate on the challenges of the moment, and deliver in a way that he did not in his first four years in office. To the extent he wants to move to the political center, which is where the work gets done in a divided government, we’ll be there to meet him half way. Translation: you need to keep compromising until you adopt our position. It's Republicans that need to move to the center; if Obama were to do so he would be moving away from the GOP. The election has changed nothing. We will have four more years of gridlock and inaction. The GOP will move further right and become even more extreme in its policy positions (yes, it's possible.) Obama will stay above the fray, focused on his legacy of serenity, of being statesmanlike, of consistently not fighting for much of anything. In four years the economy will be better but inequality will remain extreme. The national debt will be larger in nominal terms, but better as a percent of GDP as the economy grows again. The GOP will be even angrier (yes, also possible.) In the final death rattle of the current GOP coalition we will have a replay of this election with two new candidates. The Republican party will either truly reform or splinter, but cannot survive or grow in its current nihilistic form. It's going to be a rough 4 years, but the country will in the end emerge stronger as ideological extremism eventually yields to economic and political pragmatism.